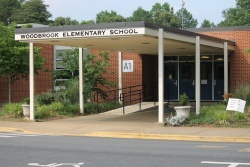 Woodbrook Elementary School is an Albemarle County public elementary school providing pre-K through 5th grade. Woodbrook is a part of both the Northern Feeder Pattern and students will attend Jack Jouett Middle School and graduate from Albemarle High School. As of 2015, Woodbrook has 357 students enrolled and employs 75 faculty and staff members. Woodbrook Elementary was built in 1966 in the heart of urban Albemarle County. Woodbrook has an extremely diverse student body and was awarded Virginia Board of Education's Excellence Award in 2008 and 2009. Woodbrook was named a Distinguished Title I School for 2007 and 2008. Woodbrook was designated as a Title I Focus School in 2016 after failing to meet performance benchmarks for state Standards of Learning assessments. The current principal of Woodbrook Elementary is Lisa Molinaro. Woodbrook Elementary is located at 100 Woodbrook Drive. ↑ 1.0 1.1 Web. Woodbrook Elementary School Profile, Albemarle County Public Schools, retrieved September 30, 2015. ↑ Web. Woodbrook planning swift, total transition to multiage learning, Josh Mandell, News Article, Charlottesville Tomorrow, June 24, 2017, retrieved June 25, 2017. ↑ Web. Woodbrook Elementary School Quality Profile, Virginia Department of Education, retrieved June 26, 2017. ↑ Web. Woodbrook Staff Directory, Woodbrook Elementary, retrieved May 31, 2012. This page was last edited on 26 April 2018, at 22:42.